I’m cautiously hugging a serpentine mountain road beyond the Book Cliffs, bordered by a sheer drop on the left and a steep mountain on the right. There’s not much room here for either passing cars or acrophobia. To be honest, this is one of the last places I would think of carving a road. Precarious as it seems, this doesn’t rattle me too much as long as it’s dry. However, I’ve been fretting for the past 100 highway miles at the stormy night sky. One year ago, my brother Paul and I maneuvered around vehicular-sized boulders fallen onto this road only to reach impassable snow drifts in June. It’s now passable and much cleaner thanks to a gray-bearded archaeologist who drove a rented bulldozer to heights that would make most other people ill. Slowly and silently I nearly idle my truck up the pass on the slick, sticky mud. It’s now 2 A.M. Had I arrived any sooner the road would be too wet to pass. Even so, I would tell anyone else to hold back, but I’ve got an appointment to keep over this mountain at the first of two locked gates barring motorized entrance to Range Creek Canyon. Beyond the top of this pass with its two hairpin turns is an uncanny transformation. Descending into the canyon, the vegetation becomes lusher. Long appendages of vapor reach out from the dark trees and into my headlights. They look like ghostly fingers grasping at me, but I drive through them with a grin and a shudder. It’s so quiet. Even my noisy old truck seems to respect the silence as it rolls on the soft, wet earth. I stop at the gate and trust that someone with access will be there at daybreak. Undoubtedly, some of the mystique of this place comes from my own boyish excitement and quite possibly from the choice of traveling here by night. This will be my last adventure in Utah before moving out of the state for advanced medical training. Without any hesitation, this is my final wish. My brother and I first scrambled into this canyon six months earlier merely to glimpse a piece of history untouched. For generations, this canyon remained a sanctuary. It actually wasn’t until 1885 that cattle ranching started here. The first brave homesteaders arrived in 1915. The now-famous Wilcox family bought the property in 1951. For three generations they kept greedy fingers away with locked gate and loaded shotgun. Getting too old to keep up with the ranch, Waldo Wilcox sold the land to the government in 2001 in an attempt to protect the ancient history hidden inside. After a few years, the secret went out—every news syndicate in America, and even some abroad, ran an article raving about Waldo’s heroic protection of this canyon. The media has a way of glamorizing a man when the truth is found in too many details. No doubt he played a major role in preserving this land from corruption, but it’s suspected he had some heydays of his own, including curiosity-born excavations with a bulldozer. Returning with administrative permits is nothing short of a serendipitous privilege. We are still the same zealous amateurs when it comes to spotting and appreciating Native American history. But, this time we’re here to teach Wilderness First Aid to members of the University of Utah’s Range Creek Research Project. This is an unimaginable dream come true: basking in the presence of archaeologists in a last bastion of untainted Fremont history. The public is welcome to the area now, as well. However, it’s still controlled and patrolled. The Utah Division of Wildlife Resources limits access. There’s no camping allowed in the canyon and the permits are required in advance. They are only good for a single day, but recently regulations have loosened to allow scheduling up to five consecutive days. No more than 28 people can schedule a permit on any given day. In some ways, those restrictions make it difficult to explore here since it’s already not easily accessible. Even so, this is a good thing since, as a species, we haven’t learned how to individually take care of the ancient things which connect us to our past. Looters and vandals frequent the surrounding areas. They are sick miscreants with no good intentions for relics and rock art. Thirty seconds after my wristwatch alarm sounds, I hear a small gas engine heading my way. A gray-bearded man hops off an ATV in the dew-laden morning air and makes cold hands work at the gate. With quick success it swings open quite wide, but I’m more impressed with the man’s welcoming smile than his dexterity. Duncan Metcalfe is University of Utah’s Curator of the Museum of Natural History and Professor of Anthropology who leads the ongoing research project in this canyon. He is the anthropologist I have always imagined, so smiling back at him is natural. Through the second locked gate lies a canyon dripping with history. The road weaves through trees and into an open field full of sagebrush where Duncan stops to point out an impossibly high granary built on a rock wall, complete with a wooden platform intact. Its natural camouflage conceals it so well a novice would never see it. Three river crossings later, Duncan points out a couple of crumbling homesteader’s cabins. At one of the cabins, the fallen timbers sprawl through the rock walls. He stops and tells the story of a young, single rancher who struggled to make a living here. He wasn’t here long before he was found dead by his neighbor. One legend says the solitude drove him to suicidal insanity, but another hints of ill feelings between the two and possible foul play. The present evidence supports the end of either story, neither one of them held out long here. Most settlers’ attempts to stay failed, except for the Wilcox’s. It’s partly a shame that three long days of first-aid lectures and workshops keep us from exploring full-time, because in between lessons students and staff talk of secreted sites and abandoned artifacts—too many to be counted. At the end of the first day, I need Paul’s assistance with the teaching. We’ve planned a rendezvous point with our GPS receivers, good weather permitting on the dirt road. Again, I fret about the thunder and lightning over the mountain pass. More water has made the road sketchier, but still passable in a light truck. Sometimes repeated activities seem less stimulating on the second pass. My repeat experiment proves there is something unusual—almost spiritual—about nighttime descent into this canyon. I ask Paul and he feels it, too. When we reach the locked gates, a large owl greets us in the shadows of the full moon. After the second day of teaching we can’t endure the lost daylight. Asking for recommended sites earns a personally guided tour by Andy Yentsch and Larry Coats. Andy is one of the field school instructors with a Masters of Archaeology and Anthropology from the University of Utah. Of all the people here he carries the most passion for teaching and converses easily. His wittiness and shaven head fit the profile of an intelligent instructor and capable comedian. One of his main projects is dendrochronology (dendro=tree, chronology=science of time). Specifically, it involves overlapping the seasonal growth rings from wood samples in the canyon to create a continuous timeline. Hopefully, some of the wood found in housing and artifacts can then be matched to the timeline he creates for more accurate dating. Larry has been asked to reconstruct climatologic data for the era of Fremont occupation in this canyon. He trained at Northern Arizona University, earning a Masters in Quaternary Sciences. His expertise involves using earth sciences to relate modern and ancient times. It’s not hard to notice him habitually scanning the horizon. He’s a climber at heart and wears an aura self-confidence backed by experience. 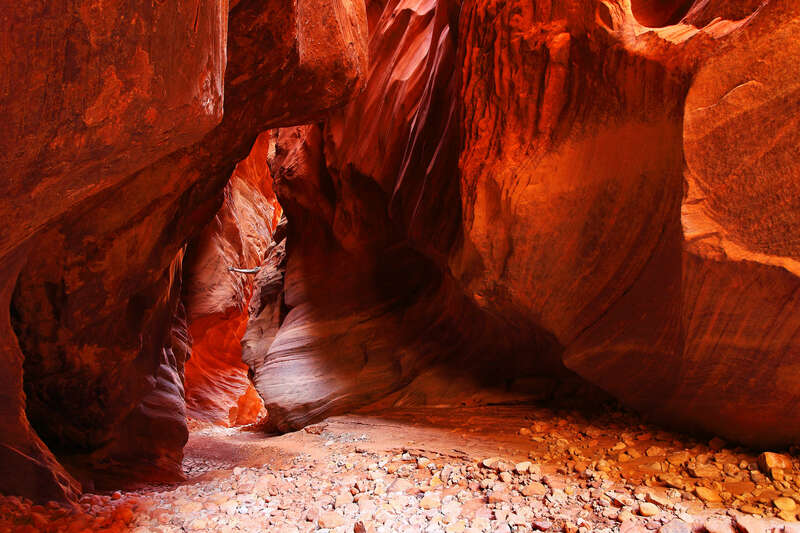 The templed rock formations that enclose this canyon reach elevations above 9000 feet—3000 above the canyon floor. Our first stop is near the edge of the ranch. Both Andy and Larry stand atop a flat rock and pause. “Do you see anything?” Andy grins at us quizzically and then glances back at Larry. The rock once was a foundation for a structure. The only remnants now are some stones scattered on top that in bulk would work well for stacking. Andy tells us that it was common for early settlers to disassemble prehistoric buildings and use the pre-selected stones for buildings of their own. Located in the base of the canyon near the road, this site was very accessible. 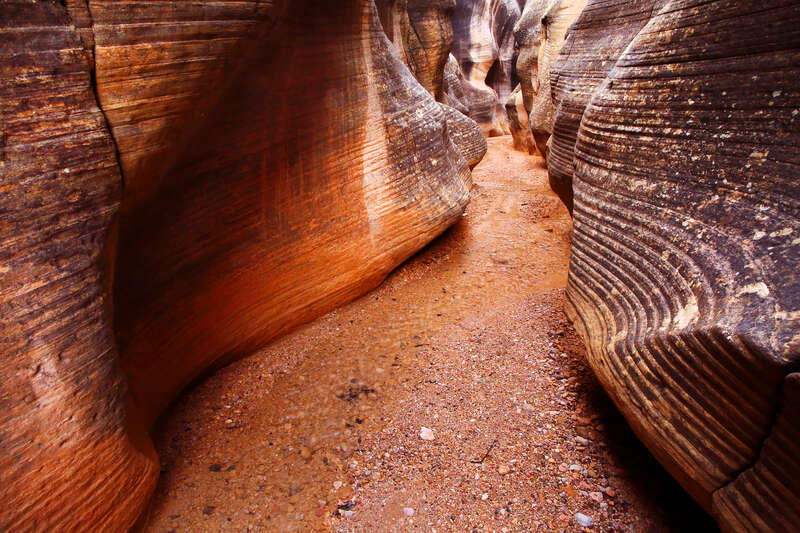 The side canyons are where things have remained more untouched. In the nearest of these small canyons, we scuttle up a boulder strewn slope. Carefully nested in a window between boulders is a cylindrical structure like a permanent basket made of rocks, sticks, and clay. It is not visible from above or below. The Fremont deposited these granaries all throughout these canyons. Some are readily visible and accessible. Others are so inaccessible even climbers like Larry would need technical gear to reach them. No one is really sure why they are here or scattered in this way. They are rarely big enough to store more than a family’s one-week supply of corn and grass seed as food. Andy holds up a piece of clay and says, “You want to see something cool? Look here and you can see the impression of the Fremont’s finger. Look closer and you can see fingerprints.” In any other canyon I wouldn’t have believed the claim. But here things are different—these prints are left from the builder of this cache, sheltered from the weather for nearly 1000 years! We track along the ridge to its end and descend. Andy and Larry reach down and pick up flecks of amber, maroon, and white stone, which they then show to us. The chips are small, like fragments of a fingernail. “These are pressure flakes cracked from chert.” says Andy. Chert is a generic term for a semi-crystalline stone not natural to this canyon. 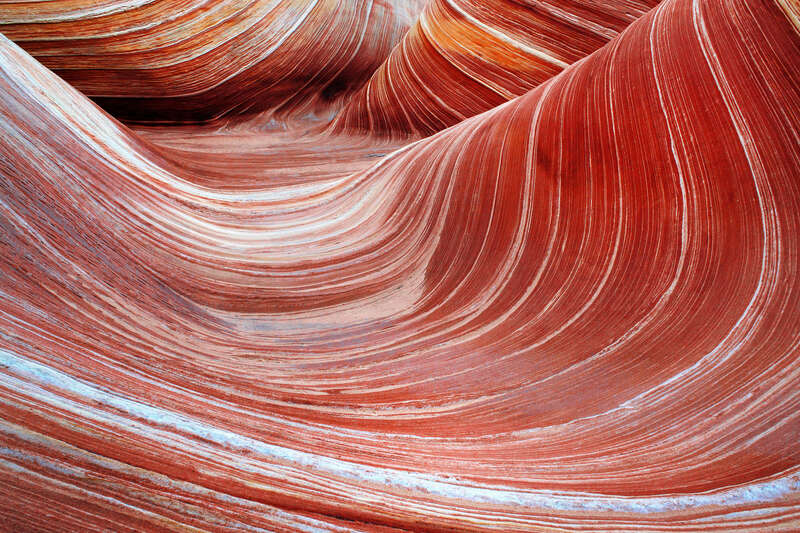 It was brought here from sedimentary beds in the Green River or beyond. Similar to glass, chert fractures in smooth, conical patterns. This property allows it to be worked to an edge. An artisan could start with a large core or blank and strike it with another “hammer stone”. The resultant smaller pieces could then be shaped into a stone tool. The sharp edges likely came from pressing the stone against an antler or hard stick with just enough pressure to cause a flake to break off. A “biface” artifact is a flat tool that has been flaked on both sides to make the edge even sharper. An arrowhead is an example of a biface. This technique can be used to make fractured obsidian, a type of chert, so sharp it’s used in certain surgical grade cutting instruments, today. In amazement we watch them spotting flakes every few seconds. At first, we can’t see any for ourselves. Our eyes have never been trained to look for such things. I feel like a kid learning how to do something. “Here’s a core stone.” Says Andy, holding up an orange translucent rock, angulated with large fractures. The rocks are all indications we might be approaching a pit house. My eyes are drawn downward, anxiously searching the ground. This has triggered an internal conflict. Until now I have only wanted to scan the horizon while hiking. Now, I’m not sure how to make the two pursuits mesh because one precludes the other. The many Fremont people who lived in this canyon made pit houses. They were made by digging a circular pit into the ground only a few feet deep and lining it with a peripheral wall of vertical stone slabs. Timbers were then laid across the top, pointing to the center of the pit. Smaller sticks spanned the timbers, supporting a final topping of grass and dirt. They were efficiently cool in the summer and warmer in the winter. However, more than one occupant must have died from either smoke inhalation or house fire, since the central hole in the roof served not only as an entrance, but as ventilation for the fire as well. Over the years, the pit houses have filled with shifting sand. Without guidance, the untrained eye would see nothing other than a jumbled pile of rocks. Closer inspection will reveal a border of stones sticking vertically into the ground. Add some scattered chert and presto—pit house, indeed. Sometimes, what appears to be a flake is the tip of a tool that has settled in the dirt. Andy’s and Larry’s success rates for spotting artifacts reflect years of experience. By now, it comes naturally to them. We leave everything where we have found it, even the flakes. The game isn’t about taking; it’s about finding. Andy tells us how ant hills can bring up chert and artifacts excavated by the ants, and sure enough, they do. As the light dims, I have trouble finding anything more. The colors begin to fade so we head back to camp. Francis, the full-time camp cook, rings a rusty triangle and everyone files in for some grub. The rest of the evening is simply ranch style. Everyone circles around the dim light from the lantern, lulled with moments of silence that would make most city folk uncomfortable. In the stillness, I realize that everything I own back home is accessory. I miss none of my belongings or bills. Well, I couldn’t leave my digital camera or GPS receiver behind, but otherwise none of it matters. Here I have the essentials: clothing, bedding, food, water, and honest company. This represents an era long dead, free from the stresses of the day. To explore and camp is a respite. But, to live and work without excess is to see the world fresh. I envy what they enjoy here. On the third day we load into the two massive passenger vans and drive beyond the south gate into the “looted territory”. There are almost no artifacts here. Granaries still dot the cliffs. Tonight the archaeologists have two chores. One is the continuation of a project documenting vandalism of rock art. The other is retrieving a piece of wood wedged deep in a fissure. Pictographs here are classified as Barrier Style Rock Art. These archaic, ghost-like anthropomorphic figures are thought to have been painted between 1000 BC and 300 AD. Their long, draping torsos have no limbs and oddly shaped heads. According to one archaeologist, there isn’t a whole lot to learn from interpreting rock art. It’s supposedly just like anything you or I might doodle. Considering myself somewhat of an artist, I have to politely disagree. The interpretations may cross too many cultural boundaries to be reliable or accurate, but dirt is for doodling; carving in rock carries some meaning to it’s creator. Back at the other van they have found and extricated a smoothed three-foot digging stick. What’s so exciting about a plain digging stick? This one had still had loops of cordage wrapped around the free end. Excitement prickles in the air. The students and instructors crowd around to see. Our beds in the bunk house were once used to host high-dollar hunters in this canyon. People would come from a long ways away to chase cougars up these cliffs in blood sport. Now, they are used to host penniless medical personnel striving to keep the words blood and sport as separate as possible. Overnight, we listen to desert packrats organize their belongings in the bunkhouse rafters. Our final day has been long awaited. Paul and I spend the whole of it following Larry Coats and Joel Boomgarden, another one of the graduate field instructors. The task is further surveillance for vandalism in the canyon. Joel has a knack for spotting things—stone tools under your own nose, potshards yards away, and even the digging stick in the heavily looted area. I try to practice spotting as much as possible with the time remaining. We visit sunken pit houses, granary storage areas, rock art sites, and even stop by some historical trash—a term reserved mostly for things that rust. The most unbelievable two pieces are cages rumored to be where Waldo penned mountain lions prior to the paid hunts. How he got the cats inside I’ll never understand. Allegedly, he said he’d “probably go to Hell for it.” Sometimes, the evidence makes him look more villain than saint. But, with all great human endeavors, mistakes are made along the way. Waldo deserves his widely proclaimed commendation for selling this property to the government for safer keeping of its precious contents. The day is coming to an end, so we start back toward the ranch for one last chuck wagon dinner. In the dusty shadows, there’s a brief moment when Duncan and Jerry, another senior archaeologist, are purposefully talking just out of earshot. I whisper to Paul for his attention and nod in their direction. He understands perfectly that I’m captivated by their authenticity. From tobacco smoke to beaten boots, they might have been dreamed up by a Hollywood costumer for the next Indiana Jones crusade. On my first day here I commented on the obscure beauty of this place. I wondered if part of the Fremont’s decision to live here was somehow related to its desert wonder. Duncan responded with insight one only achieves after spending a lifetime studying mankind. He said it is interesting to note that throughout all history humans have been tied to the land. We are the first generation in millennia to shrug off that bond of dependence. Only in this place have I ever noticed it so deeply. I could close my eyes and almost feel a primal bond to this place and those who lived here before. I want to stay here. I want to have what lies hidden: the simplicity of life, the prayers in the dust, the mystery of the Fremont forever lost on the ground and in the solitary desert breezes.